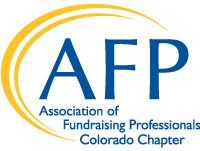 Thank you for your interest in being a speaker for the AFP Colorado Chapter! Please complete this application to be considered for one of our speaking opportunities, described below. Priority consideration is given to AFP Members. Library on a Friday afternoon from 11:30 - 1:00 pm. Education Luncheon speakers will have a presentation time of one hour. Advanced registration is required with discounts provided for AFP members and the audience size varies from 50-75 development professionals. Selected speakers receive complimentary registration to the luncheon, as well as marketing opportunities reaching over 2,000 fundraising professionals. Applications are accepted on an ongoing basis. If your session is selected for an Educational Luncheon, you will be contacted and notified which dates are available. AFP Coffee Chat is on the second Thursday of every month at Fluid Coffee Bar in Denver, Colorado. Coffee Chat takes place from 8:00 - 10:00 am. The session begins with networking until 8:30am, followed by a presentation and group discussion. The session ends with more networking from 9:30 - 10:00am. Coffee Chat speakers typically give a short 30-45 minute presentation followed by a small group discussion. There is no cost to attend, and no formal registration is required. Approximately 25-50 people show up each month. Applications are accepted on an ongoing basis. If your session is selected for Coffee Chat, you will be contacted and notified which dates are available.